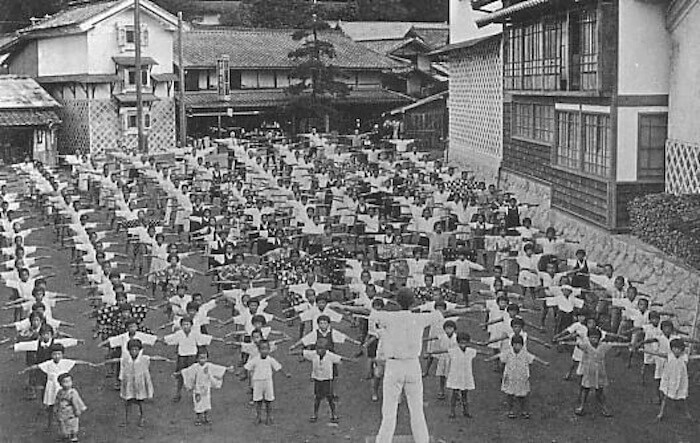 Every morning all over Japan, you can see and hear rajio taiso, or radio calisthenics. When I'm out walking in the morning I can hear the loud speakers from my company and other companies in the area and see workers outside bending and stretching. If you are at home, you can turn on your television and follow along with NHK. I thought it was an interesting exercise idea and was curious about how it got started. I found out it was started in the United States in 1925! An insurance company started the health and fitness broadcast in the US, but it didn't really catch on. Too bad, because if it had maybe Americans would be healthier today. It began in Japan about 1928 and has been popular ever since. Fitness experts claim its longevity is due to the completeness of the routines. There are two routines, each lasting around three minutes that include over a dozen different whole body exercises that improve balance, build core strength, and stretch muscles. School children and company employees do the routine every day and NHK broadcasts the routine several times a day. This is a wonderful way to begin the day...stretching is so important ...especially when you get as olde as I am (hahaha)! I wish this had caught on in the US too. I try to do a little in the mornings to wake up, and I definitely do in the evenings to stretch out my neck! I think it is an excellent idea. Too bad it hasn't caught on more widely. I remember back in the 80s there was a TV show on cable that had three scantily clad girls doing an aerobic routine. It was on for a few years and I remember doing the routine with Laurie when she was young. I was just thinking about stretching this morning when the dogs woke up. Both of them doing the same stretches, front paws stretched out, then the back ones. Proof that dogs are smarter than the average person, lol. Yes!Japanese almost elementary school students wake up early morning,and go to this gathering of routine in summer vacation.They are given the stamp card for participate…. I remember Rajio Taiso of doing the routine ,and sometime do it. 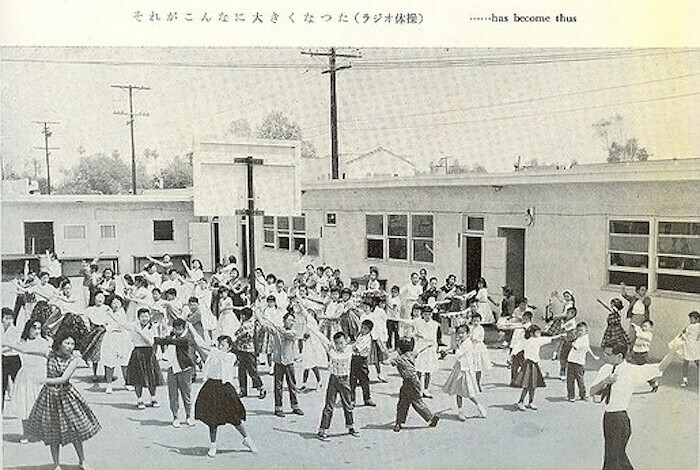 I, too, take part in Rajio Taiso in summer at our local primary school's playground. It is cool and nice early in the morning and a good way to start the day. That's really cool. Just three minutes here and there can make a world of a difference!